When I began the process of earning my Master of Arts in Educational Technology (MAET) at Michigan State University (MSU), I was a visual arts educator responsible for three art rooms in three buildings, striving to incorporate technology into my elementary art classes with limited time and limited resources. Since then, I have transitioned to a role where I teach computer science and engineering concepts to elementary students. I have full-time access to a cart of iPads. With my changing role and changing responsibilities, I have had numerous opportunities to incorporate the many lessons I have learned in MAET. While each course has taught me innumerable skills and lessons, I have learned some overarching truths that transcend any single course. I especially learned that there are wicked problems that are complex enough to seem to defy a solution and that even the most wicked problems can be approached and solved by design. Can we teach creativity? 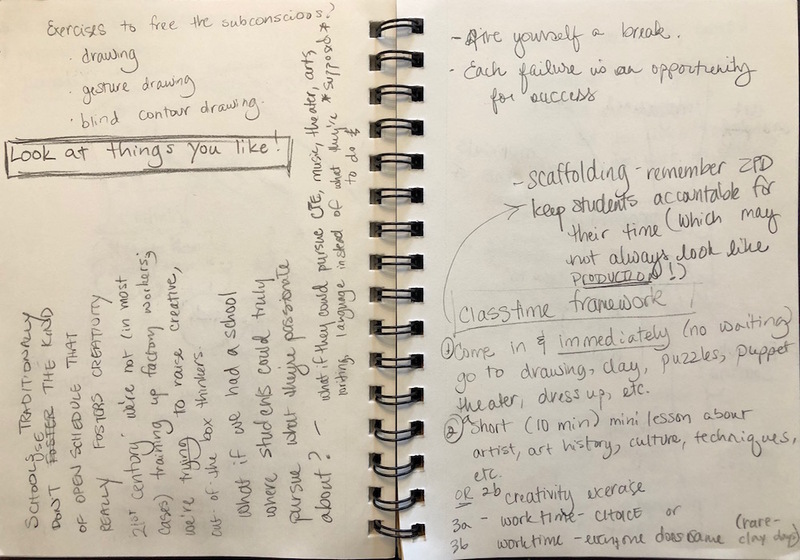 Pages from my incubation journal document the design process as I rethink my approach to my class schedule and teaching space. On a related note, I learned the importance of being able to use the design process on behalf of my students. Although I teach a version of the engineering design process to my young students, I was fortunate at MSU to take several courses that specifically utilized the design process for the purpose of identifying and defining problems, empathizing with the user, exploring possible solutions, prototyping solutions, evaluating solutions, and iterating – repeating the cycle to continue seeking the best possible solution to complex problems. In CEP 811 Adapting Innovative Technologies to Education, I learned the importance of making, making-to-learn, and the maker movement. As an arts educator, I already felt that creating art and practicing its related skills were important. I learned in this course that through making anything students can learn. I also discovered the importance of letting students share what they made with others, both for social reasons and for metacognition. According to the theory of constructivism, when people make something, they build their own knowledge. When students make, they learn skills and content deeply through the iterative process of creating, failing, and trying again. They construct new knowledge based on prior knowledge, through direct instruction and through inquiry-based learning (“Constructivism,” 2016). 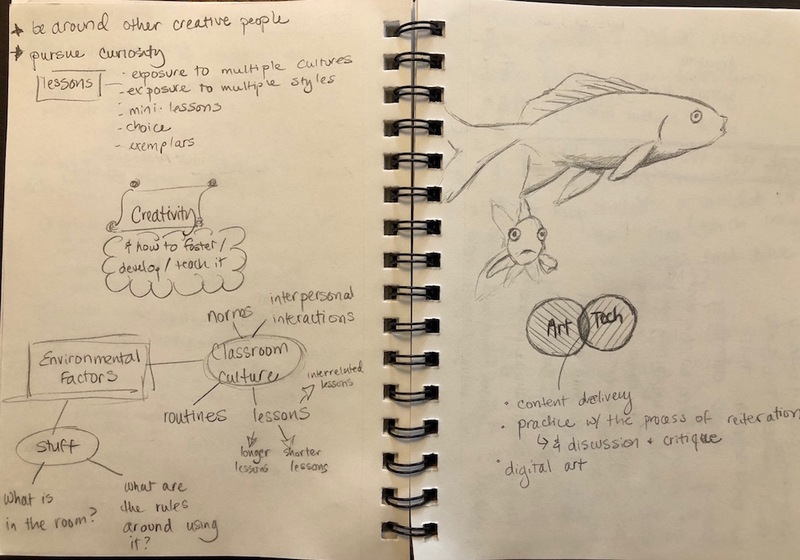 Although I read about this many times during CEP 811, it became a living lesson as I practiced it throughout the course – creating artifacts for the class and learning deeply as I did so. I shared the tutu I illuminated using LilyPad Arduino and NeoPixel LEDs at Ann Arbor’s Mini Maker Faire. While some people think of making only in terms of modern technologies, like coding, circuits, and robotics, it actually refers to the creation of just about anything. According to Dougherty (2011), founder of Make Magazine, every one of us is a maker. He says we should think of making as something akin to tinkering: being able to repair things or make things from scratch. Making is born out of two basic human needs: the need to create, and the need to be part of a community, to be social (Martinez & Stager, 2014). Our need to create can be fulfilled by making anything – a handmade dress, a clay bowl, a painting, a good meal, a refurbished engine, or anything else you can imagine. And our need to be part of a community helps to explain the increasing development of hackerspaces, Maker Faires, and other social gatherings that surround making. Dougherty (2011) says of the social aspect of making, “The opportunity to talk about that object, to communicate about it, to tell a story about it is another way we learn at the same time we teach others,” (p. 12). In other words, people love to get together, talk about what they made, see what others have made, and learn even more about their own creations as they tell others about them. This definition of making explains why so many of my students are excited to create a sculpture in art class or an animated story in computer science class and why they are also excited to tell others about it. It’s also why setting aside time in class for sharing is critical. According to Seymour Papert’s theory of constructionism, when students tell about what they make, they build their own knowledge. Constructionism takes constructivism to the next step by incorporating a social component. According to Martinez & Stager, constructionism is “learning by constructing knowledge through the act of making something shareable,” (as cited in Rosenfeld Halverson & Sheridan, 2014, p. 498). 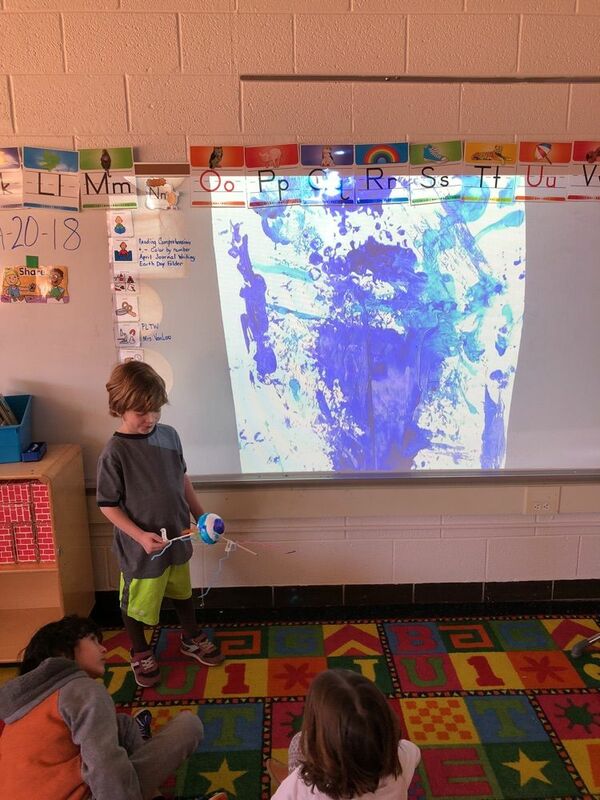 Kindergarten students share painting tools they created. This class helped me realize that both making and sharing are critical parts of the learning process. 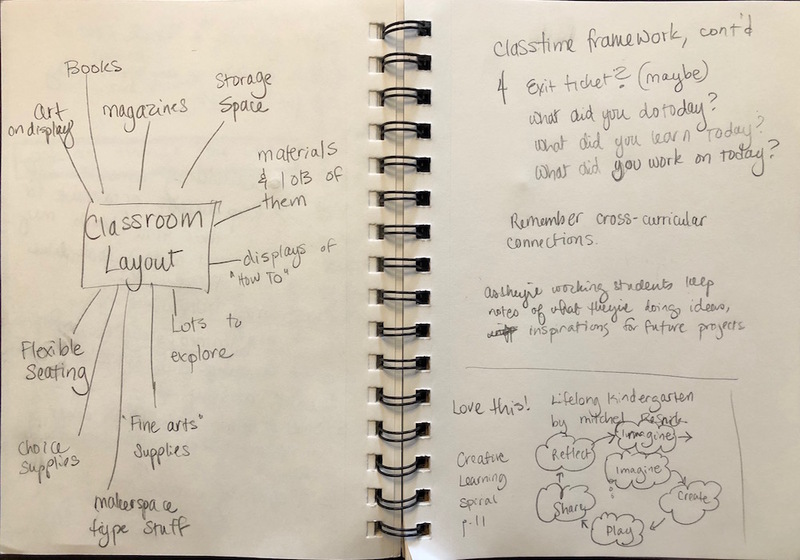 Although I already had a sense that sharing was important for metacognition, my newfound understanding of constructionism made me keenly aware that sharing is also a necessary process for helping students construct knowledge. Sharing is now a part of every module I teach. 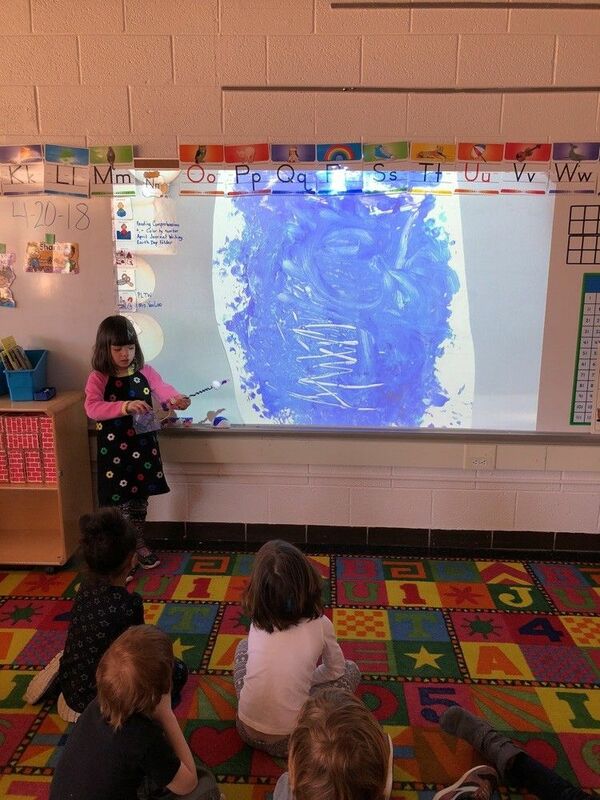 Sometimes students share with the whole class, and sometimes they share using digital technology to record their thoughts. Either way, though, they get an opportunity to tell others about what they made and what they learned through the process of making it. When I started CEP 813, Electronic Assessment for Teaching and Learning, I didn’t know what to expect, especially because I had already taken undergraduate courses in assessment. I began the course with a bit of trepidation but was pleasantly surprised to discover that it focused on authentic assessments – both assessments as learning and assessments of learning. Through the reading of scholarly articles about assessment, I cultivated a list of features of well-made assessments that now impact my teaching practice on a daily basis. I explored various technology tools for summative and formative assessment. These included tests, rubrics, and digital portfolios, as well as non-traditional tools like games and videos. Through my work in CEP 813, I figured out how to use my course management system (CMS) to have digital conversations with my students even when I am unable to meet with them each day during class. Two of the most impactful lessons I took from this course are the importance of the feedback loop in assessment and how digital tools can be used to enhance and support assessment. Throughout this class and during the year since I have worked to thoughtfully include formative assessments within each lesson. As I observe students, provide feedback, and give students time and opportunity to act on that feedback, we are creating a feedback loop. That feedback loop is critical for student learning and growth, as well as for my planning and modification of each lesson to meet students’ needs. As I discovered in CEP 813, feedback should be timely, direct, and specific. It can help students gain more understanding and give them “more self-regulation over the learning process” (Hattie & Timperley, 2007, p. 90). When teachers help students answer three questions: “Where am I going?” “How am I going?” and “Where to next?” (p. 90) they can help students close the gap between where they are and what they are trying to achieve. Feedback, which can be provided during formative assessment, should be given early enough that students can act on it. It reveals students’ progress toward a learning goal, their thought processes, and possible misconceptions they hold (Trumbull & Lash, 2013, p. 2). Utilizing digital tools can make learning more accessible for all learners by allowing teachers to implement universal design for learning (UDL). Educators can represent information through multiple means by utilizing digital tools such as audio files, videos, and images to support text. This can help ensure that all students are able to access assessments (Meyer, Rose, & Gordon, 2014). As Sams and Bergmann (2013) point out, the addition of digital tools to the traditional problem sets, textbooks, and other activities means all students have the option to use “the resources that best suit them to master learning objectives” (p. 19). As an elementary educator, one digital tool that has been an invaluable resource for me in this regard is Seesaw. 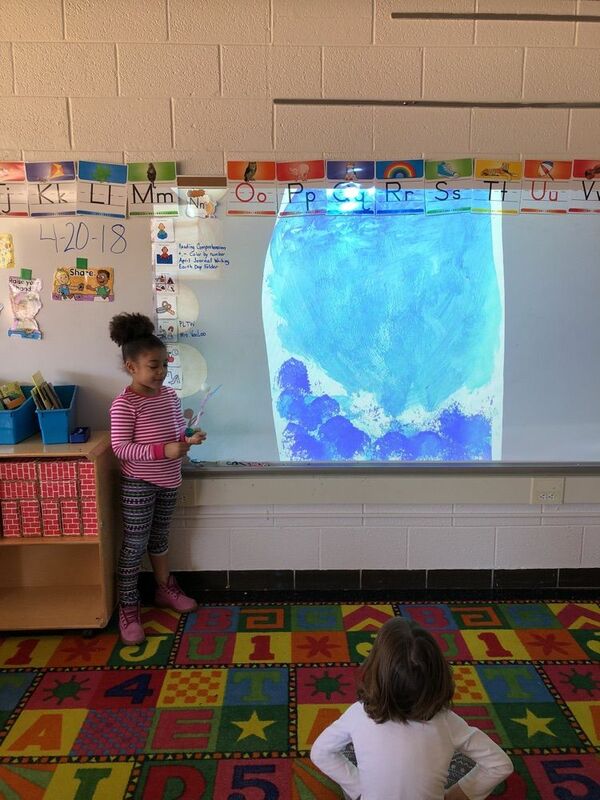 Through Seesaw I am able to share digital information back and forth with students in the form of photos, videos, screenshots, drawings and more. Students can reflect on their own work and we can share all of this with parents. I’ve used it to communicate with fifth graders about their robotics code and to save and share first graders’ recordings of their animated stories. Using this digital tool and the feedback loop of formative assessment has transformed my teaching practice. Although I am a certified visual arts educator and I have been teaching engineering, technology, and the design process for the past several years, this mantra became a strong and well-defined part of my teacher vocabulary following CEP 822 Approaches to Educational Research last summer. One of my favorite subjects to teach in my current position is computer science. My elementary school students enjoy coding. Motivation is not a problem, because they are excited to see their projects come to life on the screen. However, some students have a difficult time with large, complex coding projects because they struggle with decomposition – breaking big problems into smaller problems and also with debugging their code when it does not work properly. Decomposition and debugging are two of the many component skills of computational thinking. The problem of how to best help my students learn these critical skills became the driving question of my research during CEP 822. I conducted a literature review of 18 peer-reviewed research articles that address the issues of computational thinking and computer science instruction in K-12 education, and where possible, with K-5 students. Through my research, I learned that one major recommendation for teaching computational thinking is to implement a comprehensive K-6 computer science curriculum, based on a scaffolded approach to instruction, where each year’s curriculum builds on the skills learned by students in the prior year. I am fortunate to teach computer science in a district that already provides such curriculum beginning in kindergarten or first grade depending on the school. For struggling students, I found several specific, research-proven recommendations, which I describe in detail in my research report. I now consider those recommendations, including the use of universal design for learning, explicit instruction, student-to-student collaboration, and unplugged activities as I plan for my instruction each day. Watch my five-minute overview of my research to learn more. Those supports help me and my students in our joint pursuit of learning to be creators. Using the design thinking process to approach wicked problems. Learning to make and making to learn. Including digital tools in instruction and assessment. Supporting struggling learners of computer science. Teaching computational thinking to all because we are all creators. These are just a few examples of the immense effect MAET has had on me, and I am so grateful for this experience. All images and videos on this page were created by Sarah Van Loo or her students.